Liverpool captain Jordan Henderson politely informed this producer that his wife may well be going into labour. It’s fair to say he wasn’t expected this response! As seen in the video below, Henderson and Trent Alexander-Arnold were preparing to shoot a feature for LFC TV. However, after the Reds midfielder brilliantly puts his hand up like he’s still at school to inform the producer that his wife may well need him after receiving a text, he responded by suggesting that his partner could wait for 20 minutes. 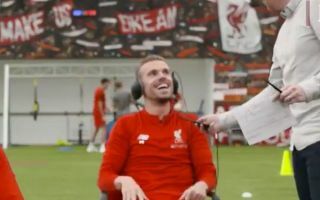 Naturally, Henderson and Alexander-Arnold couldn’t control their laughter as work clearly comes first for this professional individual, but it’s unclear if they did actually finish off shooting the feature before he left to be with his wife. When you’re on a shoot and @JHenderson tells you that your wife’s waters have broken! !